Eighteen months ago, AGCO Corporation found the solution for the technology gap on the manufacturing floor to support the rapid decision-making, transaction processing and overall information needs its production environment demands. Now that emerging technologies like Glass have proven the value of checklists in wearable format, we are moving to interface our solutions with ERP systems, like SAP, to drive even more rapid and automated decisions within the business. AGCO is now configuring its standard work instructions and operating management systems for Proceedix on Glass. When implemented, this will give AGCO a number of new leading-edge capabilities on the production floor, including real-time training, quality gate issue trending, and pushing visual management to all users through beacons, trends and thresholds. In the following video, recorded at the Augmented World Expo 2017, AGCO's Peggy Gulick talks about the wearable journey of her company and how Proceedix and Glass assisted with AGCO's digital transition. Welcome to another exclusive interview with a top user of wearable technology in enterprise. From world-class physicians to leading innovators in industry, we give you insight into the experiences of those paving the way for wearables in the workplace–in their own words. We recently sent over some questions to Peggy Gulick, Director of Business Process Improvement at AGCO. 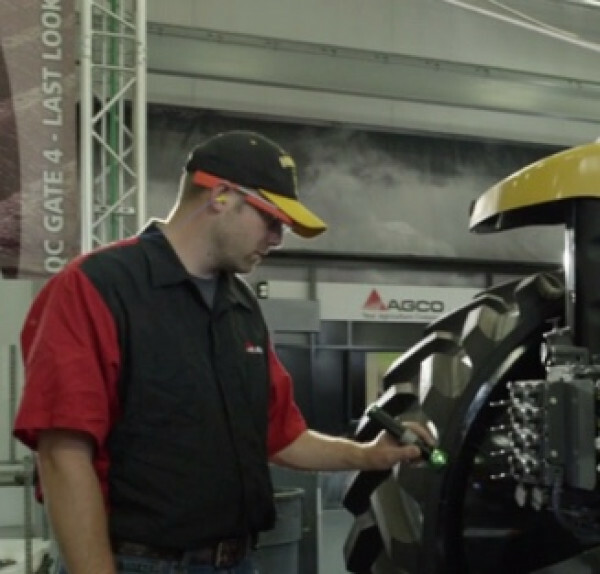 AGCO is a global leader in the design, manufacture, and distribution of agricultural equipment; the company’s use of smart glasses is one of the best – and most successful – use cases to date. Read Peggy’s thorough and enlightening responses below, and to hear more from this wearable tech pioneer, you can watch Peggy’s hit presentation from last month’s Enterprise Wearable Technology Summit. Enjoy! BrainXchange (Q): To begin, how about you provide us with a little background on yourself and your career? What does your job entail, and how/when did you first learn about wearable technology? Peggy Gulick (A): I am an English and Art major gone wrong. Late in my educational endeavors, I realized that I thrive on, and am genetically disposed to, process and the pursuit of perfection. Once into the business world, I found myself marrying my BS in Computer Science with a thirst for more and more knowledge of the why’s and how’s of business processes, from the front office all the way to the manufacturing floor. My path from Arthur Anderson to IBM, Jarden Pure Fishing, and now AGCO has given me the foundation to make a career out of systemic and sustainable thought and change management. Through lean thinking and a cavalry of engineers, system analysts, application programmers and forward-thinking, hungry business process owners, there is never a dull day in the quest to make employees more interactive and organizations more efficient and profitable.Time has presented the world with more tools to add value in systemic and sustainable solutions, especially in our manufacturing excellence journey. A simple problem – tablets being dropped from 12-foot high tractor tops during final factory inspection quality checks – prompted us to think outside of the box for technology solutions that could not be dropped but were readily available. With open-minded leadership and a group of engineers ready to prove the concept of wearable technology as either fun or function (or both! ), we were on our way to thought-provoking testing, incredibly partnerships, and cutting-edge solutions that have already proven their value. BrainXchange (Q): When did it become apparent to you that wearable tech –specifically, smart glasses – could benefit your business? How is the technology used at AGCO? Peggy Gulick (A): In December 2013, we knew that wearable tech may play an important role in our company’s vision. Smart glasses, although a new concept to industry, presented an idea to fix an ongoing issue with broken tablets in Quality gates and inspection areas. We immediately began proving the theory that wearable technology, specifically in the form of eyewear, was a tool and not a toy. When a process calls for real-time input of data in order to provide timely information to prevent quality issues, even a few seconds to find a misplaced tablet or walk to a terminal to input results is too long. Exasperate the situation with broken tablets, frustrated employees, and consequential rubber stamping of results and voila! the idea was born. When the tool is literally incorporated as a part of the employee’s person and data input is a simple tap or word away, information becomes more meaningful and timely and repeat problems decrease in volumes immediately. The use of the technology was piloted in our Quality area, specifically the final factory inspection. We have since broadened the use to Assembly and Paint work instructions. What started as a niche application has quickly expanded to plant-wide visions and a multitude of functional areas clamoring to try out their ideas for leaner, more quality-driven processes aided by wearables. BrainXchange (Q): What did it take to incorporate smart glasses at AGCO? Did you seek out technology or software partners? How did employees react? Were all on board with the idea of wearing the devices while they worked? Peggy Gulick (A): Being on the front end of emerging technologies certainly has its ups and downs. The business case, when we started, was more a kiss and promise due to the disruptive nature of the technology and the lack of benchmark solutions. Using a purposed consumer product in the enterprise proved to be challenging. Our goal in our initial experimentation with hardware solutions was to prove their wearability, ergonomically acceptable form, and overall function for long periods of time. Once we determined the acceptability rating of the tools, we quickly focused our efforts on application partners. We determined that we had neither the bandwidth nor the industry benchmark to program the software in-house. We began our search, mostly through internet queries and In Mails to find a partner that was willing to focus their development efforts on improving the plant floor experience –specifically productivity – and realize actual benefits (not just the cool factor) while changing the paradigm for all manufacturing. The most noted and newsworthy implementations of wearable technology applications at the time were medical. Research in medical development teams led us to a couple of companies that were experimenting with wearables. We quickly complimented each other: AGCO with the vision and willingness to build requirements, test versions, and provide timely and measured feedback; and the developers with the technical expertise to make it happen. We chose a company in Belgium, Augnition, for their incredible knowledge base, technical skills, experience, accessibility, and eagerness to broaden their manufacturing partnerships. Our partnership with Augnition – now called Proceedix – is the backbone of our solution and to-date success. Additional partners were sought to provide safety shields that meet our OSHA requirements; and, finally, our device management needs, in order to not only simplify version upgrades but to secure our devices. Like a three-legged stool, each of these partners are essential elements necessary to run a successful enterprise solution. BrainXchange (Q): Did you encounter any major challenges in implementing the technology? How did you overcome the obstacles you faced? Peggy Gulick (A): Great question! Although I would have said in the early stages of the project that the utter lack of companies and vendors with actual solutions to benchmark and apply created challenges, we have not only risen above that but have reclassified it as an advantage. We have remained true to a very strong vision based on input from engaged employees and lean processes. We have had the opportunity to have a strong voice with our partners, adding value to their solutions as well as our factory. This project was different than other projects in our plant due only to the disruptive nature of the technology and vision. Sponsors, resources and partners were all needed to insure success. Getting buy-in may be tough in some companies, but my leadership was willing to commit to the core requirements of the pilot and take a risk on a somewhat crazy idea. Every milestone was a celebration and led to a new test. Key milestones included: determining that smart eyewear was ergonomically compatible; creating an application that ran on the smart eyewear; making sure the glasses met OSHA requirements and safety policies; and insuring the devices were secured and the application was manageable. BrainXchange (Q):How did you gauge or determine the success of incorporating smart glasses at AGCO? By positive employee reaction, customer feedback, or other measured benefits or improvements? Peggy Gulick (A): This project is no different than any other that requires capital. The business case needed to show recordable value within a specified time period. Since the metrics were difficult to apply numbers to, we knew that there was a greater risk of failure, both in perception and quantification. We strategically chose to measure value through process time reductions, quality improvements, and safety incident reductions. In addition, since employee acceptance and ergonomic and cultural fit are critical success factors, we knew that change management was going to be more essential to obtain and audit closely throughout the project. In the past few weeks, we have been fortunate to present our project to broader audiences sharing similar visions. The incredible acceptance of the work that we have done, including winning the Highest Achiever Award for Internet of Things in Manufacturing Leadership, and the strategy forward has reminded us of the success to date. The initial assessments and time studies have shown up to a 25% decrease in process time and significantly reduced quality issues, driving Quality Right First Time. We have increased the business case, reset the gauges, and plan to continue to implement smart wearable technology solutions throughout our plant, from component manufacturing to finished product inspection. BrainXchange (Q): AGCO seems to be using smart glass technology in a number of applications, including for checklist documentation, on-the-job training, and safety. Do you plan or hope to use smart glasses in any other ways? Peggy Gulick (A): The Jackson plant doesn’t plan on resting with just the smart glass benefits in quality and assembly. We have detailed business requirements and functional specifications for usage in operation management systems, standard work instructions, and on-the-job training, welding control point data allowing employees to make decisions and even correct errors, warehouse picking and receiving, streaming data from the field to technicians in the plant for real-time problem resolution, and, finally, enhancing our plant tour experience. As we have developed the current business requirements and beat our initial business cases in productivity, quality and safety metrics, I know that we continue to pursue best-in-class manufacturing in Jackson, MN with Manufacturing 4.0 and wearable technology at the forefront of our operational excellence. BrainXchange (Q): Have you explored any other wearable tech devices besides smart glasses? Can you see other wearables making an appearance in your workplace in the future? Peggy Gulick (A): We have experimented with multiple brands of smart glasses, including Vuzix, Epson, and Google. We have also incorporated ring scanners to buffer the smart glasses in scan-intensive work areas. We also tried smartwatches. The smartwatches that we tried all required a connection to an Android phone to function. We had specific guidelines to our strategy, including avoiding tethering and dependency on other devices, preferring a standalone device. When choosing the hardware, we have insisted on a solid business case, although we have allowed some leeway in terms of the “cool factor business case” in order to get the tools on the floor and in the hands of employees, especially those outside-the-box thinkers seeking ways to improve their work areas. You need to know the value that the wearable will bring to the business area in order to prioritize implementation strategies and stay committed to sustainable applications. In order to do this, you must benchmark the current state, even though it may be difficult to put accurate metrics in place to determine improvements on initial pilots. For AGCO, walking distance to get information (bill of materials, sequenced instructions, images) and safety audits specific to the use of hands for climbing, assembling and receiving materials were essential. All seven wastes of lean manufacturing – Transport, Inventory, Motion, Waiting, Over-Processing, Overproduction, and Defects – have ultimately become metrics for AGCO as we continue to audit our successes and improve our business cases. We have found the voice prompting and recording to be invaluable in areas that require real-time information and data collection, especially when the employees are being asked to climb. Side note: It is hard to resist bringing additional technology into the plant. The advancements that are occurring as the market realizes the value of wearables in the enterprise continue to enhance the “wow” factor. We have stayed true to the tools that we began our journey with, knowing that in the end the success will be the sustainability in our plant and the breadth of the application (Proceedix) to support multiple hardware platforms as the market grows and changes. BrainXchange (Q): Is there a wearable gadget you would like to see invented for your business? Describe your ideal wearable device. Peggy Gulick (A): That is a tough question. As I let my mind wander with big thoughts and idealistic solutions, it is difficult to process past the litigious society we live in. So, for this response, I am going to ignore the privacy and security issues that will be at the forefront of wearable tech advancements, and graciously leave their pursuit to the experts. Focusing on the critical points of communication that drive data captures, information processing, decision making and finally execution, I believe the wearable market will continue to focus on eyes, ears, and mouth specific to the business cases we are currently pursuing. We already have collaborative robotics enhancing human ability to work stronger, more accurately and efficiently. Wouldn’t it be cool if the devices we choose to enhance the critical senses were inherently safe, less invasive (even invisible! ), and focused on synergizing the enterprise lines of communication currently existing in isolation? The tools will need to connect and support all linkages of physical and automated work, in addition to being ergonomic and user-friendly. Really, this is pursuant of the focus on the Internet of Things. I hope to experience Orbit City before I leave this earth. George and Jane Jetson showed us a world where day-to-day life is leisurely, mostly due to far-fetched (or are they?) robotics and smart, interconnected virtual labor-saving devices. BrainXchange (Q): Do you use any personal wearables while not on the job? Peggy Gulick (A): I wear a smartwatch to gauge my sleep, heartrate and exercise performance. I do not use smart glasses once I leave the plant. I depend on my smartphone for voice guidance and to keep me informed (oftentimes too informed). As technology continues to advance for the consumer and the enterprise, I find myself seeking ways to widen the fine line that exists between work and family. Accessibility is a smart device-enhanced expectation. I am thrilled to be moving it from my personal world and applying it to my enterprise strategies, where real-time information and decisions drive profit.